A Rise and Fall of the Great Powers for the post–Cold War era—a brilliantly written, sweeping new history of how empires have ebbed and flowed over the past six centuries.The death of the great Tatar emperor Tamerlane in 1405, writes historian John Darwin, was a turning point in world history. Never again would a single warlord, raiding across the steppes, be able to unite Eurasia under his rule. After Tamerlane, a series of huge, stable empires were founded and consolidated— Chinese, Mughal, Persian, and Ottoman—realms of such grandeur, sophistication, and dynamism that they outclassed the fragmentary, quarrelsome nations of Europe in every respect. The nineteenth century saw these empires fall vulnerable to European conquest, creating an age of anarchy and exploitation, but this had largely ended by the twenty-first century, with new Chinese and Indian super-states and successful independent states in Turkey and Iran.This elegantly written, magisterial account challenges the conventional narrative of the “Rise of the West,” showing that European ascendancy was neither foreordained nor a linear process. Indeed, it is likely to be a transitory phase. 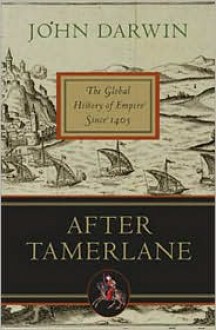 After Tamerlane is a vivid, bold, and innovative history of how empires rise and fall, from one of Britain’s leading scholars. It will take its place beside other provocative works of “large history,” from Paul Kennedy’s The Rise and Fall of the Great Powers to David Landes’s The Wealth and Poverty of Nations or Niall Ferguson’s Empire.